Ticket To Ride was slang for a lady of the night getting a clean bill of health to do her work? As the keynote breakfast speaker, Rick entertained and educated our members about how the Beatles' business model is applicable and relevant to anybody starting or running a business. I enjoyed how he wove the anecdotes and acoustical guitar interpretations with the seven best practices the Beatles used to achieve commercial success. I applaud his efforts to remind us about the Beatles' impact on both music and popular culture. Rick's multi-media Beatles presentation was the perfect combination of music, visual imagery and interesting stories about how the Beatles became so successful. 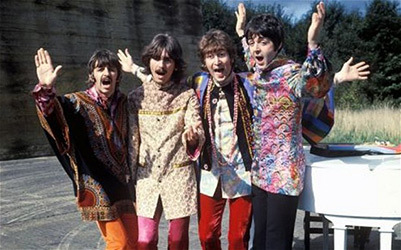 Using the Beatles' business model as reference, Rick explained the keys to success: a good foundation, sound business strategies and the right people. Rick delivered this message in a fun and entertaining way. Very well done. Thank you! Rick was the keynote speaker for our annual holiday luncheon. Our members truly enjoyed Rick's acoustic interpretations of classic Beatles music. We learned how today's businesses could learn from the business model the Beatles used in their rise to fame. The content was concise and deftly delivered. Rick delivered sound business advice through the music of the Beatles. In a fun and entertaining way he discussed the seven business lessons that any company can learn from the Beatles. His acoustic guitar interpretations of Beatles songs reinforced his message. If you're looking for a unique presentation, I would contact Rick ASAP. Rick was the keynote presenter for our June Luncheon. He provided our members with a unique and fun "experience" in which he combined live music with best business practices -- giving our audience a very entertaining and enlightening experience they won't forget! 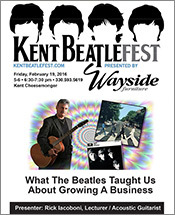 The business of the Beatles program Rick presented at The Club at Key Center was absolutely fascinating! I posted the "7 business lessons" handout on my office wall. Great stuff. His musicianship and behind the scenes knowledge of how the Beatles impacted the music industry and business practices as very impressive. It was a very enjoyable and engaging presentation which we will definitely book again. Rick put on a great presentation at our breakfast. His knowledge of the Beatles is amazing, and his passion for the group shows throughout his talk. The music interjected in the program makes it more enjoyable. 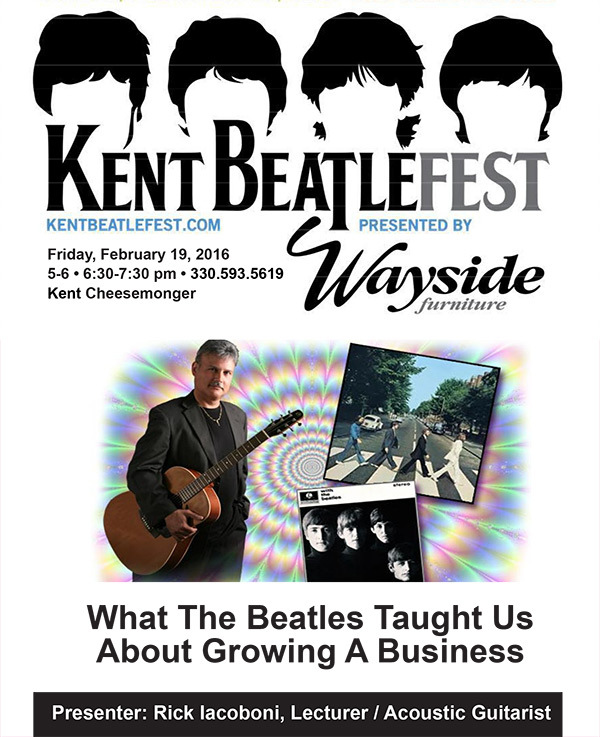 As a featured speaker for the 2016 Kent Beatlefest, Rick gave a unique presentation about the business model the Beatles used to achieve super-stardom. The standing-room-only crowd at our venue appreciated both his accomplished guitar playing skills as well as his expertise on the topic. Rick's behind-the-scenes stories about how Beatles songs were written and recorded illustrated the seven lessons that any person could apply into their own organizations. It was a fun and entertaining way to learn basic business principles. I highly recommend this presentation.